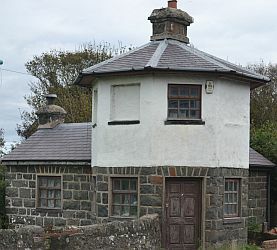 The community of Trewalchmai is situated about 5 miles from the town of Llangefni on the Isle of Anglesey. The proper name of the parish is Trewalchmai . There is a connection between the name of the parish and Gwalchmai ap Meilyr (1130-1180), one of the earliest poets at the Court of the Welsh Princes. The townlet and its lands were given to the poet for his services to Prince Owain Gwynedd. 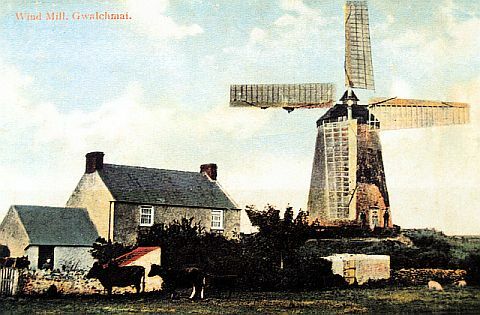 Upper Gwalchmai was the original village, with most of the population living close to the site of the Parish Church. When the new post road from London to Holyhead was built, Lower Gwalchmai was very quickly built near the new A5 by Thomas Telford. The turnpike (tollgate) was built around 1820 and the cost of passing through with a horse and cart was three pennies. The toll was abolished in 1895 and the building lost its function. The clock was built in 1926 by John Griffiths, a stonemason from Llangefni, to commemorate the young men who were lost in two world wars. As many as 30 young men from the area were sacrificed in the Great War, and then another 9 died in the Second World War. The commemorative monument is one of the finest memorials to be built in a village on the island. St Morhaiarn Church is the oldest building in the parish. It is impossible to put a definite date to it, but part of it was built in the fifteenth century, and the foundations are as early as the twelfth century. The Chancel and nave of the Church can definitely be dated to the fourteenth century. Moriah Chapel (Congregationalist) was opened on Easter Sunday and Monday, 1847. 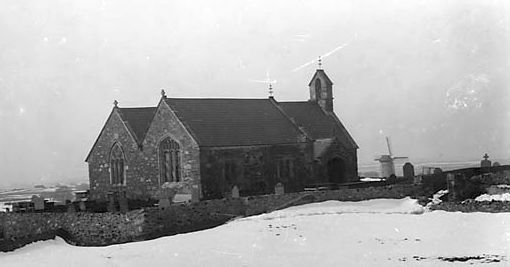 It cost £120 to build.The new Moriah chapel was built in 1902, and is positioned, more or less directly opposite the old chapel. Jerusalem Chapel (CM) was established in 1780, re-built in 1849 and restored in 1925. The Baptist Tabernacle Church was built in 1890. Today, it is the center for the Pensioners in the village. Ysgubor Esgob – Referred to in a document in 1306 as the property of the Bishop of Bangor, and also in a document in 1700 as the property of Penrhos Estate. Spite Inn – The name derives from the old Roman word “Hospitium” and is an indication that a hotel existed there in the Middle Ages. Hendref – There is a stone at Hendref with the letters and date OH1675 chiselled into it. The exact same letters, but with 1674 as the year, have been chiseled into a stone at the bottom of a window in the Parish Church. 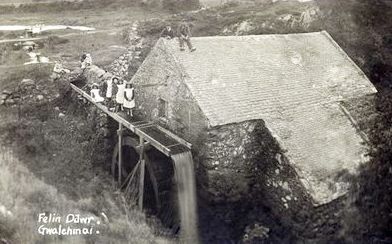 River Ddrydwy Water Mill (known as Afon Felin to the local residents) – Built at the beginning of the nineteenth century, it produced electricity to the village until 1946. The National School, which was opened in 1856, was the first school in the village, and managed by the Church of England. There were 43 children attending regularly. In competition, a British School was opened in Upper Gwalchmai a few months thereafter.Today, the school is called Ysgol y Ffridd and has capacity for 96 children.